Sinus and Allergy Disorders - David J. Hoyt, M.D. 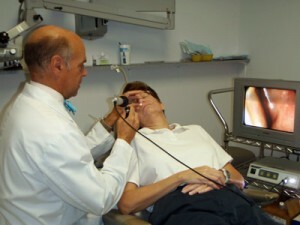 Approximately one in eight adults have suffered from a sinus infection within the last twelve months. This accounts for about 20 million cases of sinusitis in the United States each year. Many of these infections start as a common cold; and then progress to symptoms including nasal congestion, facial pain and pressure, and purulent nasal discharge. Approximately 2% of colds will progress in this manner to become bacterial sinus infections. While most of these can be treated effectively with antibiotics, some patients may suffer from prolonged, or repeated infections. In those cases more aggressive treatments may be necessary. Effective treatment of allergic disorders, avoidance of environmental irritants, and correction of nasal anatomic deformities are all effective options in reducing the severity of sinus symptoms. While few are enthused about surgical treatments, there are currently a variety of options now available that reduce the amount of tissue removal and therefore they are more tolerable by patients, and shorten their recovery. Allergic rhinitis is the fifth most common chronic disease in the United States. Its symptoms include nasal congestion, nasal discharge, itch or watery eyes, and sneezing. The symptoms may have a seasonal variation, or they may be present on a year round basis. The symptoms are generally caused by the body’s response to inhaled substances. Various tree or grass pollens, as well as cat or dog dander, dust, and mold are common stimulating factors. Determining which substances are provocative factors for each patient is an important step in helping people reduce or avoid these substances. Treatment options include oral and topical medications. Immunotherapy or allergy shots may be necessary for certain highly allergic individuals for whom other forms of treatment have been ineffective. Allergic conditions can cause chronic nasal inflammation and they are a significant factor in causing recurrent sinus issues in many patients. If you believe you are suffering with allergies or another sinus disorder, please see your doctor or contact us for an appointment.